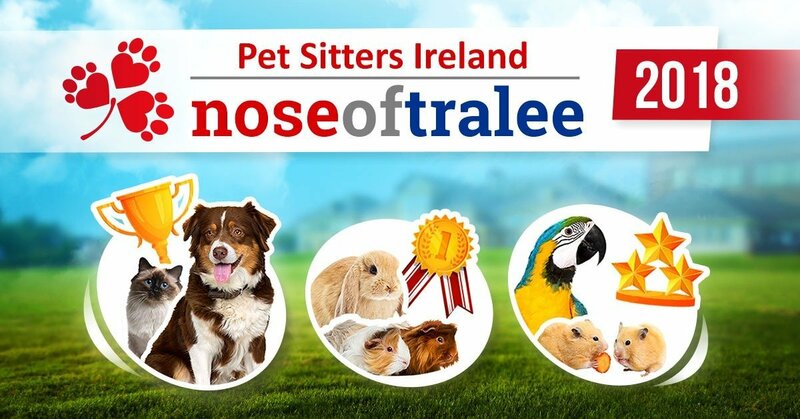 Pet Sitters Ireland’s Nose of Tralee Pet Competition Is Now Open For Entries and animal lovers across Ireland are being invited to submit photos of their pets for the 2018 Nose of Tralee competition. The 5th year of the event promises to be the biggest yet. Open to all types of pets across the 32 Counties of Ireland it is Ireland’s largest pet competition that includes all animals, not just cats and dogs! To enter pet owners need to submit a photo of their pet looking fabulous and tell us why their pet deserves to take the title of ‘2018 Nose of Tralee’. Over the last 4 years we have seen all types of pets enter the competition, cats, dogs, horses and even a pig! Pets have a chance to be one of 32 county finalists, with an overall Nose of Tralee winner and runner-up. All finalists from the last 5 years of the competition will also be invited to a Nose of Tralee party at the end of August. The competition is open for entries from 11th-30th June, after which a public vote and judging will take place. “This year we can’t wait to see a variety of different types of pets enter and we are especially looking forward to meeting all of the 5 years of finalists at our live event” says Kate McQuillan, owner of Pet Sitters Ireland.